Start 1/48 LG 2 Decals. This is a supplemental decal sheet that goes along with their superb book on LG 2. Each of the various subjects is taken from a photo in the book, so the schemes are as accurate as can be made. These are all Bf-109s, with most of them being 109Es as that is the subtype that was flown for much of the time with LG2. There are an even dozen schemes with the planes being in a variety of schemes. The last two are F-4 versions flown by Major Gordon Gollub who took over the unit when it became JG 77. First up is an E-7 from 3 staffel of I./LG2 in August 1940. It was based at Calais and is in a heavily modified RLM 71/02/65 scheme. Note that this unit used grey aircraft numbers, something that has fairly recently come to light. From the same staffel in March 1941 is another E-7, grey 2. this one has fairly pale yellow ID markings. Same unit, this time in May of 1941 based at Griechenland in prep for the Yugoslav/Greek campaign. This one has a very thin yellow fuselage band in front of the fuselage insignia. Brown 3 is also an E-7, this time in RLM 78/79/65 with lots of RLM 70 overspray. Black 3 is from 2 staffel during August 1941 in full eastern front markings. Like most of the previous planes, it is in a modified RLM 71/02/65. In RLM 75/75/76 with pale yellow cowling is a Stabschwarm aircraft based in Rumania during August 1941. Scheme seven is similar to the previous offering and from September 1941. It is in RLM 71/02/65 and also has a pale yellow cowling. The other theater markings are in the darker shade and thinly applied. In a desert scheme is a Stkpt. 1. (J)/LG2 aircraft, white 9 in December 1941. Grey 5 is next in RLM 71/02/65, also from December 1941. Note that the aft fuselage marking has been masked off when applying the fuselage band. The tenth and last E-7 is Hauptman Herbert Ihlefeld's aircraft from December 1941. It is also in a modified RLM 71/02/65 scheme. The final two are Gordon Gollob's 109F-4s, both of which were originally painted for the desert and over-painted prior to delivery. In all, it makes for a great sheet of a fairly unknown unit and an excellent companion to the book. 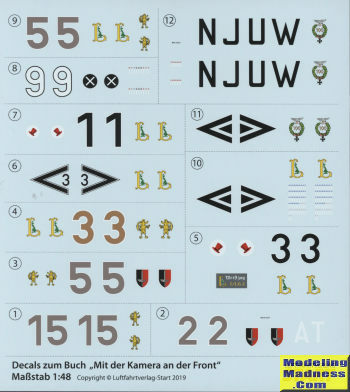 Like other Start decals, only the unique markings are reproduced. This allows more options on the sheet as most of us will have kit decals we can use for the common stuff.